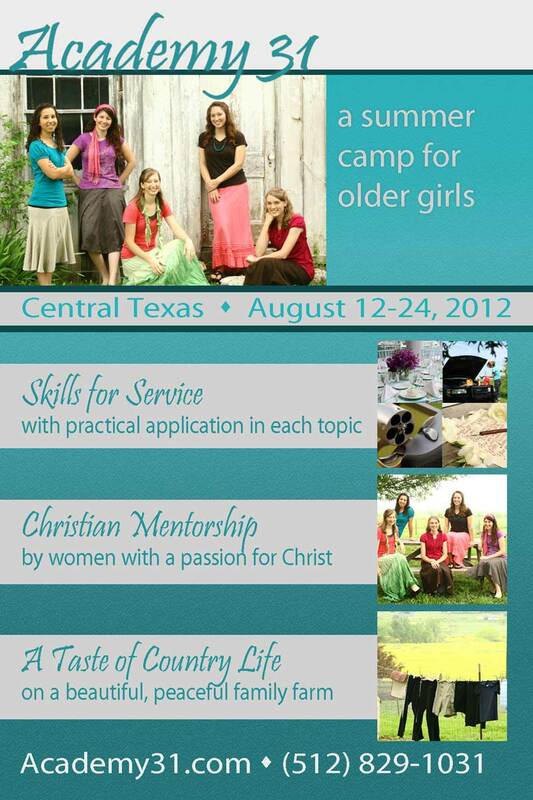 Living for Jesus: Attention Young Ladies! It has recently been made known to me that there are a number of outstanding events for young ladies coming up this summer here in Texas! They look like wonderful opportunities for receiving Godly encouragement and practical training in so many areas of life. If you are a young woman, please consider looking into how you might participate in one of these events. For starters, in the month of July, there will be two conferences held back-to-back in Carrollton, Texas (Dallas area) hosted by the Mally family and their Bright Lights ministry team. Back when I was involved with Maiden's Quest retreats, Sarah Mally, the founder of Bright Lights, was a huge help to me with wise advice, great ideas, and practical resources for putting on a retreat/conference like MQ. We actually borrowed from the model of the Bright Lights conferences when planning our own. They are full of great teachings, hilarious skits, beautiful music, and Godly role models. On a completely different note, it gives me great pleasure to introduce to you a new ministry that is launching this summer called Academy 31! From the looks of it, Academy 31 seems like a two-week Maiden's Quest experience - only run by different leaders and located on a lovely farm in central Texas! This unique summer camp experience for young ladies who are in high school or beyond promises to provide in-depth Bible study, practical skill building, and the fun of life on a farm. I know a couple of the leaders involved with Academy 31 as well as the host family and can, therefore, highly recommend signing up for this one-of-a-kind camp! The dates are August 12-24 and they are only accepting 18 girls, so time is of the essence if you want to participate in Academy 31! Please check out their BEAUTIFUL website and learn more about this wonderful new ministry! (along with hubby ;-) will be attending the Radiant Purity Conference in Carrollton! I'm so excited to be attending something like this that includes both parents! An Update from the Brittons!